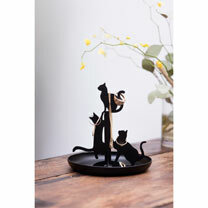 These playful cats want to help you put away your jewellery. Simple assembly required, dish base can also hold rings, earrings and backs. Height 14cm, diameter 14cm.